2 cups riced cauliflower - you can get it already riced at Trader Joe's as a time saver! In a large skillet, over medium heat, add your green pepper and onions to the pan. Cook until the onions are translucent. Add your ground beef. Break it up and stir everything around. Continue to cook on low to medium heat, depending on your stove. While the meat is cooking, toss the cauliflower rice on the stove in a medium sized skillet, over medium heat. Season with salt and pepper. It will cook in just a few minutes. I like to cover my pan so it speeds up the cooking a bit and kind of steams the cauliflower rice. When the ground beef is just about done, add your taco seasoning and stir until the ground beef, green peppers, and onions are coated. When the ground beef is finished cooking, turn off the heat. Turn off the heat on the cauliflower rice, and start making your bowls. Add a bunch of your favorite greens to your bowl first. We use spinach and/or kale usually depending on what is in the fridge. Then add your cauliflower rice next. The ground beef goes on top of the rice. Then add your favorite toppings. 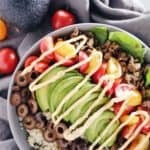 We like to put cabbage, fresh tomatoes, olives, avocado, salsa and chipotle lime mayo from Primal Kitchen. Get to eating these bowls up! They are bursting with flavor and are filling too!